The Wild West was a tough place and you had to be tough to survive! If you wanted to get your hands on your share of the bounty, you’d have to fight for it. Fist fights, gun fights, duals and brawls – it all went down in the Wild West! Luckily, in Novomatic’s video slot, Wild Bounty, it’s much easier to lay your hands on the bounty! This game has an RTP of 95.38% - which is much better odds than you’d be facing if you were a real cowboy. Along with a decent payout percentage, Wild Bounty has a lot to offer. There are 5 reels and they are adorned with the nicely designed symbols that make the game. These include lots of characters from the Wild West, like cowboys and wenches! The symbols and the reels are located in the dry plains of the west. There are a few clouds in an otherwise blue sky. What’s even better than the design of this slot is the fact that there are 50 paylines and two jackpots! As you spin the reels, you’ll have 50 ways to win. When you trigger the bonus game, you’ll get the chance to go for the mini and the maxi jackpots. In addition, you can also win free spins in Wild Bounty. This is not the only slot of its kind from Novomatic. Other slot games that’ll be enjoyed by bounty lovers and cowboys are: Wild West, Bank Raid and Bull Rush. What’s in the Wild West? Whatever you’ll find in the Wild West, you’ll find on the reels of Wild Bounty. There are card value symbols from 10 to Ace, in a western font. Ace is high and these symbols look like they were written on the door of a saloon! There are also a number of picture symbols, which give payouts of between 5 times your bet up to 20 times your bet. These picture symbols include: a sack of silver coins, a Wild West wagon, cactus, golden horseshoes and a beautiful wench wearing a rose in her hair. For the card symbols, the silver coins and the wagon, you need to line up 3 or more on a payline to win. For the other symbols (the cactus, the horseshoes and the wench), you can win by lining up two or more on a payline. Only consecutive matches will award the payouts that are shown on the paytable. All values will reflect your current bet. The 50 paylines are one-way paylines and wins will only be paid out when the consecutive matches line up from the left-most reel. The cowboy is this video slot’s Wild symbol. He might look tough but he’ll actually always have your back. He can fill in for any symbol when he lands in the right place at the right time. He’ll act as substitute whenever he can help you get a payout! The cowboy can land on any reel except reel 1. He’s only not able to stand in for the Scatter symbol. In Wild Bounty, the Scatter symbol is the Sheriff’s badge. These are rare symbols but they’re as awesome as they are rare! When you get three all in one spin, the game, that can also be played offline, will award you 5 free spins! This Scatter symbol can land on the first 3 reels (1, 2 and 3). 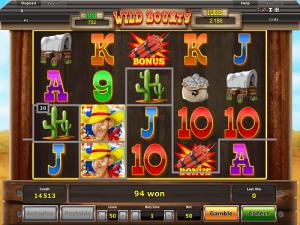 Aside from all the great payouts you might win, the real bounty in this slot game are the two jackpots. You will get the chance to win these when you spin three bonus symbols! The bonus symbols are a stack of dynamite sticks. The bonus is called the Safes Saloon and you’ll need this dynamite to break in! You’ll need a dynamite bonus symbol to land on reel 2, reel 3 and another on reel 4. The dynamite will explode and you’ll enter the Safes Saloon! You get 8 games in this bonus and there are 5 safes. The four silver safes may contain diamonds and the middle gold safe may contain additional free games. For each of the 8 games, the silver safes will be opened one by one. If only one safe contains a diamond, you’ll win 1x your bet. If two safes contain diamonds, you’ll win 2x your bet. If three safes contain diamonds, you’ll win the mini jackpot and if all four safes contain diamonds, you’ll win the maxi jackpot! If none of the safes contain a diamond, the middle golden safe may be opened to reveal additional games!